Hey everyone! As mentioned, I wanted to do a post covering some of my favorite moments from Chris Samnee’s run as Daredevil artist. 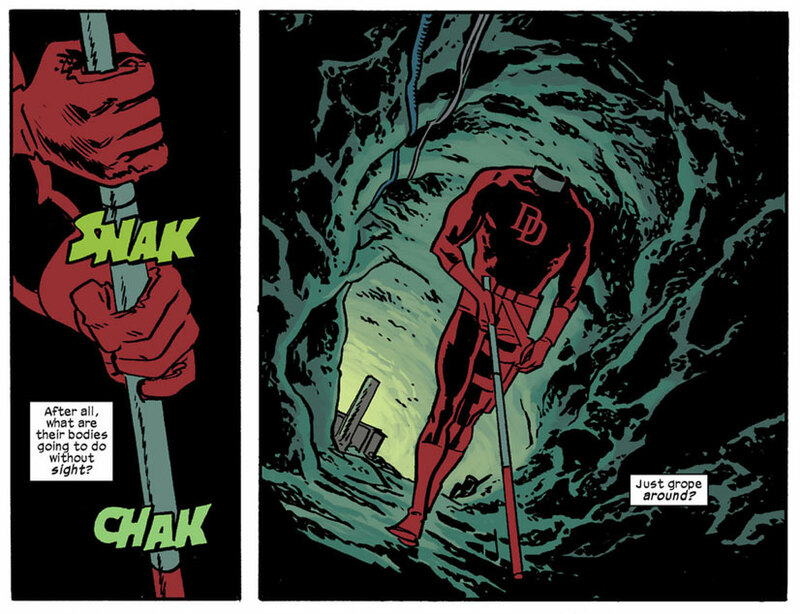 Now seems like the perfect time since, as of Daredevil #20, Samnee officially became the most prolific artist of the relaunched Daredevil; his seven issues thus far beats Paolo Rivera’s six, and Marcos Martín’s three. 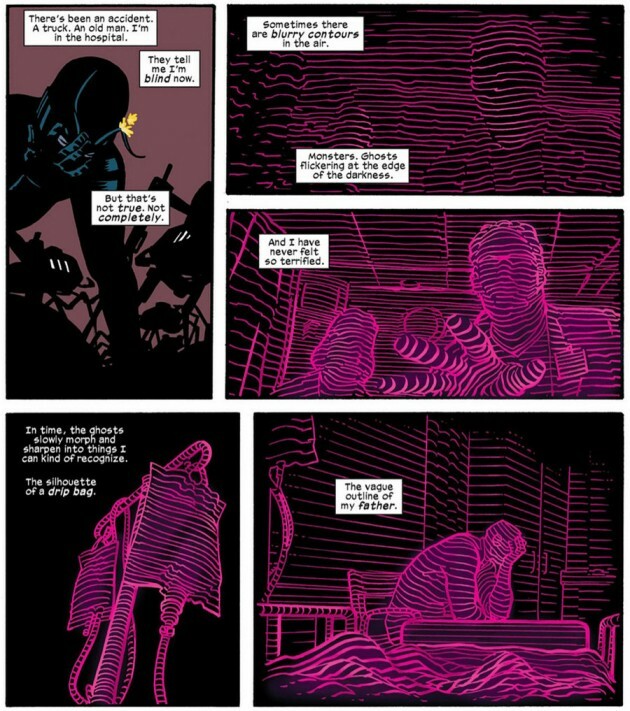 There’s also been a long line of guest artists, such as Khoi Pham (Daredevil #10.1, and 13), Kano (Daredevil #8), Marco Checchetto (Daredevil #11), and Michael Allred (Daredevil #17). Since list posts are all the rage these days – actually, they have been for years – I thought I’d make this a list post. However, this list won’t actually rank anything or present anything in any kind of order. Each panel or set of panels will just be a very arbitrary “best of” whatever category I find appropriate. And yes, even the categories are arbitrary. And possibly just a tad irreverent. Here goes! I can’t help it. I smile every time I look at this panel. It’s the bulging eye, and Doctor Strange’s rough handling of Hank Pym that reminds you of a stern parent attacking a pre-schooler with a delousing comb. While Strange making a penlight out of his finger (“E.T. go home!”) is a nice touch, it’s really the eyeball that does it for me. Actually, this really isn’t a good cup of tea at all. I mean, it has drugs in it. 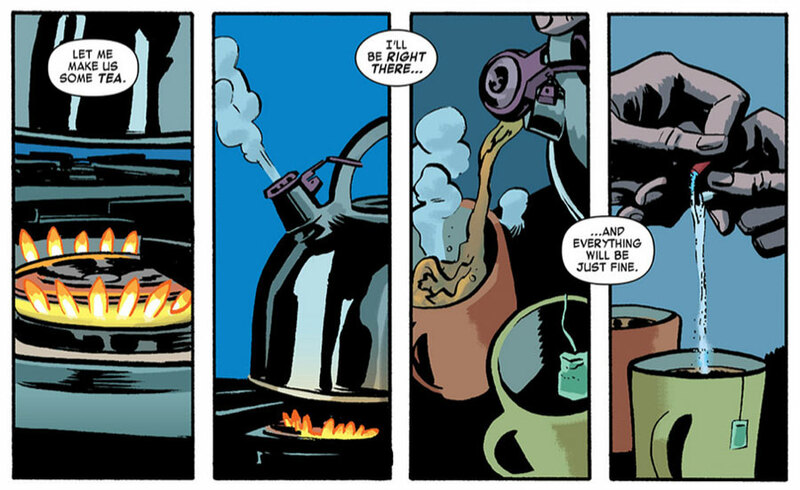 Still, if I ever wanted to spike a cup of tea, I’d have Chris Samnee draw the graphic novel adaptation of my true crime story. As I mentioned when we talked about these particular panels on the podcast, you can almost “hear” sound effects that are not even there, showing that even the simplest of scenes benefit from a great artist who doesn’t seem to mind spending the extra time making them stand out. I was going to name this “best display of emotion” or something along those lines. Then I realized that it really is the snot and saliva situation that sells this scene. Foggy isn’t just sad, he’s drooling-into-his-pillow inconsolable. It’s a beautiful thing. You knew there had to be a radar scene on this list, right? While Samnee may have had the concept for the radar passed down from Paolo Rivera, I really do like his take on it. The radar lines seem a little thicker and the way he obscures the finer details of characters’ faces really works for me. In the scene above, we see Matt’s radar kick into action for the first time and the transition from just barely there to something more tangible is very cool. It’s a fisheye lens effect! With Foggy in it! What’s not to love? So, can you sue someone for sexual harassment in the workplace even if you don’t technically work together? If so, Matt might have a case against Kirsten McDuffie. This scene is very funny and, yes, very “hot.” I love that she went to the trouble of getting one that says “YOU ARE DAREDEVIL” on it, even though that might take away from the realism. As a visual gag, it’s a good one! 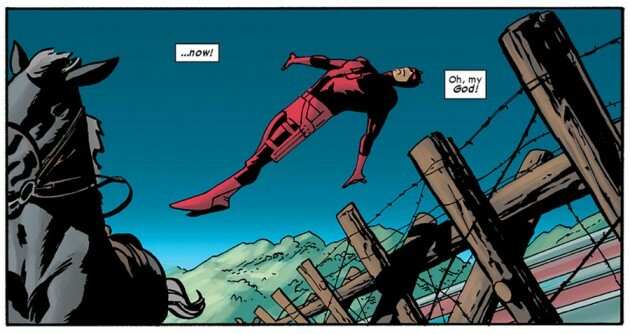 This is such a great Daredevil moment. His fearlessness extends to keeping his head cool even when said head isn’t even attached to his body. Thanks to Chris Samnee’s perfect rendition of the two-point touch technique (yes, I notice those things…), Matt’s headless body looks like a text-book example of a blind guy missing a head. Daredevil is all about elegance, even when he’s missing all of his senses. Yeah, that’s how much of a show-off he is. He should take that dive to the Olympics, I tell ya. You’ve gotta love this one. So funny, yet very much in character. I hope we get to see more of it! Much has been said about this scene, the one preceding it (where we meet these unfortunate heads for the first time), and the whole issue. 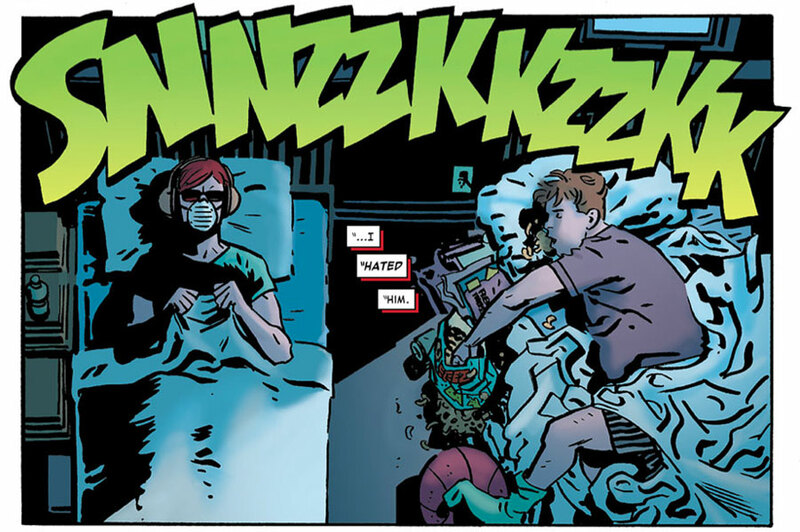 Waid writes a great horror story and Samnee does a great job bringing it to life. This is morbid and disgusting and oh so pretty. While I loved the Kuljit (as in Kuljit Mithra who runs ManWithoutFear.com) cameo in Daredevil #14, the one above – picturing colorist Javíer Rodríguez – has to be the winner of the two, if only for the attitude and the absurdity of the scene. 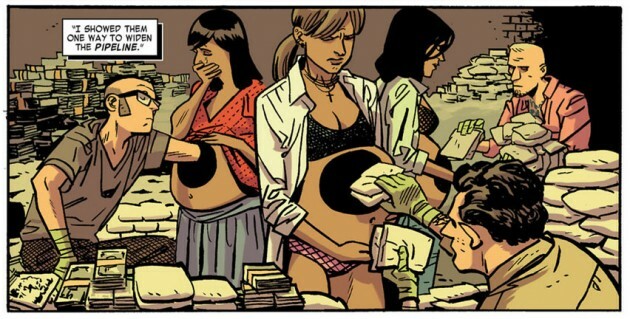 Stuffing drugs into pregnant women’s bellies is hard to beat. Chris Samnee is an expert at conveying the emotions of the characters and this has to be my favorite angry Foggy face. I’ve worked in a couple of different research labs (in genetics and biochemistry) and I have a secret for you: I hardly ever wore a lab coat. Of course, there was also that unfortunate incident where I didn’t wear gloves for a DNA extraction and spilled phenol on my hand (washed it off with polyethylene glycol in seconds though so it didn’t scar), but that’s a story for another day. What I guess I’m trying to say is that lab coats are not as mandatory in research labs as people might think. 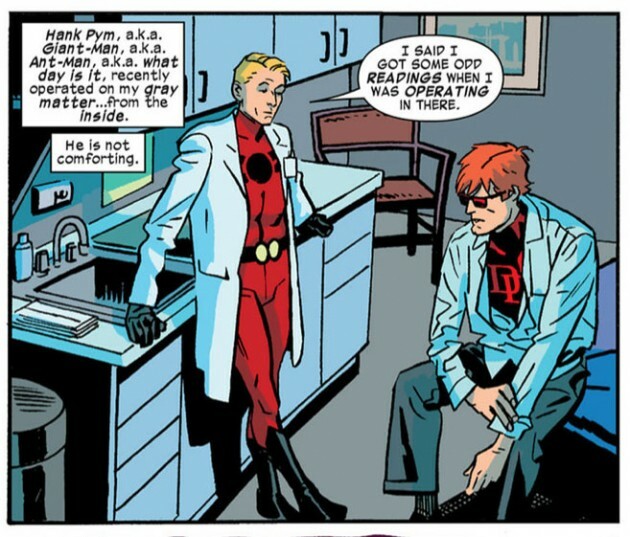 But, more people should definitely wear superhero costumes under their lab coats. It’s a great look. And, it comes with gloves. 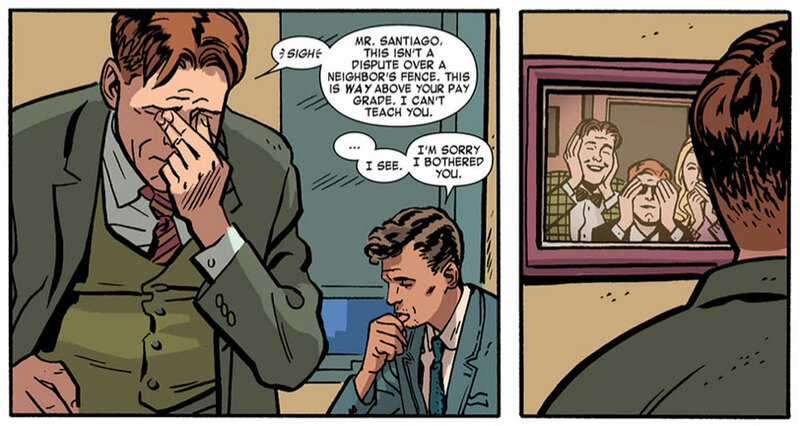 There was a time when Daredevil’s billy club was full of stuff. Not all of it was terribly useful, but there’s no denying that a clothespin comes in handy in stinky environments. And, you’ve got to love the look! That’s all folks! 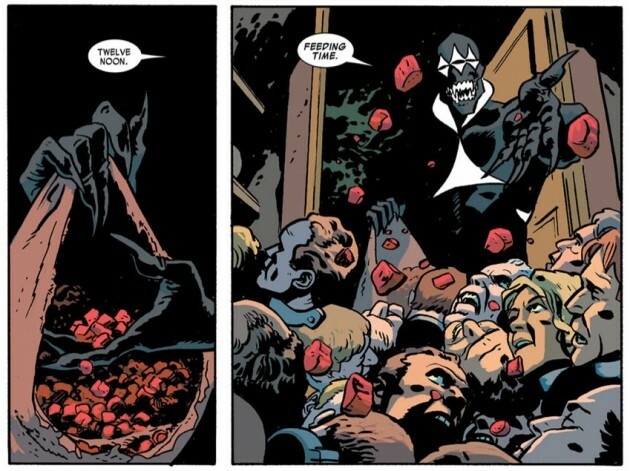 What are some of your favorite moments from the last few issues? Let the rest of us know in the comments! 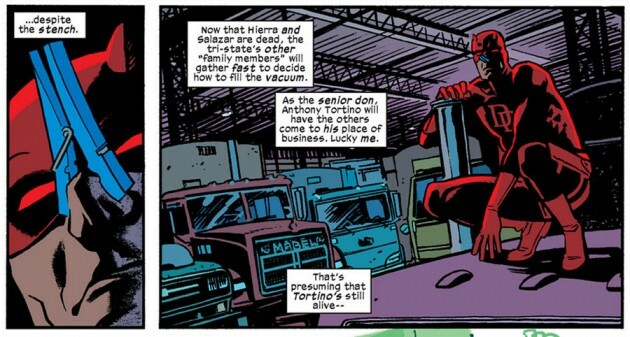 Oh, and before I go, I just wanted to let you know that Robert of The Matt Murdock Chronicles finally got through reviewing the entire first volume of Daredevil. I’m impressed! Good list. One moment I didn’t see on here was the splash page at the end of Daredevil 18, I believe? The one where Foggy is at the mental hospital, looking into Milla Donovan’s padded room… and she is in there, stuck in a straight jacket, wearing a thousand yard stare. That one definitely stuck with me. Thanks, Reed. Yeah, the Milla splash page is really good too. I suspect there’s really more going on with her than just the Coyote moving things and people around. In that last page of Daredevil #18, she’s clearly out of it (as she should be), but when she’s in Matt’s apartment she comes across as fairly lucid. There’s something fishy about this. On the mucus entry, credit to Samnee indeed. When someone is distraught, sad or crying, snot is often overlooked and neglected in favor of just tears. By adding that very normal, human touch, Samnee conveys the emotion perfectly. On the indecent exposure, love the little sweat beads on Matt’s face. Very small detail, huge fun result. 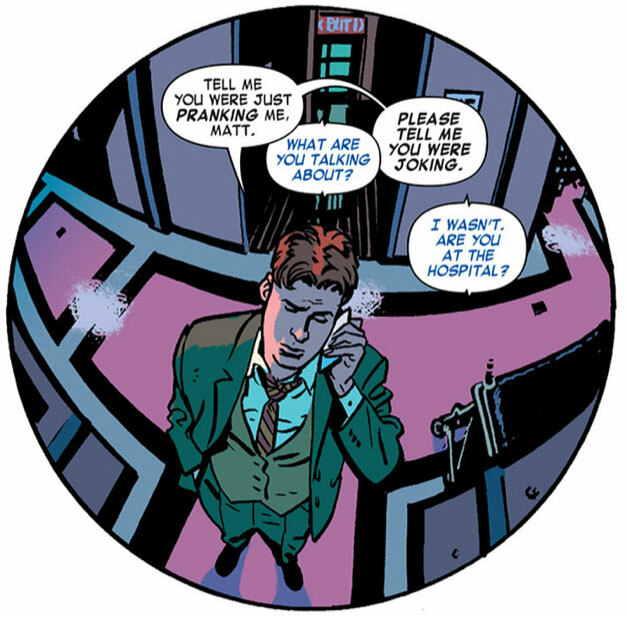 Is “The Matt Murdock chronicle” website dead? Sorry, but I don’t know any other place to ask.